Editor's note: CNN agreed not to use the full names of the family members in this article due to concern for their safety. 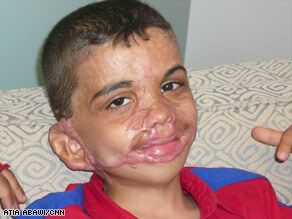 Youssif, burned by masked men in Iraq, has regained his smile. The 5-year-old Iraqi also is learning English. LOS ANGELES, California (CNN) -- Youssif is in his bright orange Spiderman shirt -- and he's speaking in English. "Look I can jump, it's very scary," he says. He ponders the distance for a moment, then hesitantly takes two more steps down the jungle gym. Imitating his favorite superhero, Youssif quickly jumps through the air and lands on his hands and feet in a pool of sand. "That's hard," the 5-year-old Iraqi says. A year ago, Youssif barely spoke to his parents in Arabic, let alone in English; he had retreated into sullen isolation after being terribly burned when masked men doused him in gasoline and set him on fire in Baghdad in January 2007. Youssif has been in California for 10 months, undergoing facial reconstruction surgery and receiving other treatment for his burns. As his scars heal, his self-assurance has returned. He is full of animation and laughter. His right dimple is ever present, and his eyes seem to smile with every word. Youssif has made incredible progress since starting kindergarten this year, even after missing a month due to surgeries and recuperation, according to his teachers and the woman helping him rehabilitate. "I can do it, I can do more," he says after finishing his latest class assignment. "I know when he started school, things were so new [and] so frustrating for him," says Keely Quinn of the Children's Burn Foundation. "I think as he succeeds at school, the momentum of what he's capable of learning really picks up." At his suburban Los Angeles home, Youssif scurries out of the living room and comes back trying to balance a stack of toppling books. He shares his entire collection one by one, handing a book to his sister. "Youssif's imagination has really developed and grown since he started school," Quinn says. She recalls how after getting an assignment to draw a yo-yo, he began with a complex picture of grass, birds and clouds in the sky -- and a young boy. For the most part, kids in school are sensitive to Youssif's situation, but he is not immune to stares and comments. One classmate told Youssif that he would only be his friend if his face got better. Youssif admitted to Quinn that he was angry and sad about the situation. They worked together to help Youssif respond to such encounters and agreed that next time he would say, "That's too bad because I have a lot of fun with my friends." "It's tough because Youssif's second language is English, so he has to be really prepared with these phrases," Quinn says. "But it's also very powerful to be able to say something rather than sit there and be very vulnerable and feel embarrassed about it." Youssif's mom: Why my son? Youssif's family has adapted well to their lives in the United States. They take English classes, go on weekly walking trips to the grocery store and have a fondness for cheeseburgers. Even with weekly calls home and chats through their webcam, the Iraqis say an emptiness persists without the bedrock of having extended family nearby. But they're well aware that they can't go back to Iraq. "It's very dangerous for us," Youssif's father says, shaking his head. "We can't go now. We can't." Zaineb, Youssif's mother, is hardest hit. She has said she longs to go back and see her family in Iraq, but she's tormented that it would be too hard on her family here. She recently learned her younger brother is engaged -- another family milestone she has missed. "Sometime she cry about her family," says Youssif's dad, who also is speaking English. "Sometime she says, 'I want to go now to Iraq.' But I say, 'No, it's too dangerous.' She say, 'No, I want to see my family.' But she knows it's difficult. After that, I take her to [the] park to change mood." The family has not decided whether to stay in the United States long term or to look at other countries where they have relatives. "I think family support was such an important part of their lives before Youssif's injury, and I think it's going to be really important as they settle into their new life and create their new normal routine," Quinn says. For now, the immediate focus is on Youssif's surgeries. The latest major operation was June 24. Dr. Peter Grossman with the Grossman Burn Center used a technique that has helped remove many of Youssif's facial scars. The doctor inserted tissue expanders, small balloonlike modules, in both of Youssif's cheeks and above his chin, where he has good healthy skin. It will allow that good skin to be stretched and for more scar tissue to be removed. Although similar to a procedure performed last fall, these balloons are much smaller and the recent surgery was less risky. "All the surgeries we're doing are getting smaller and smaller, but I think this will be a big step forward to getting him to look as good as possible," Grossman says. With every step, Youssif's father and mother say they are grateful to the CNN viewers who responded to Youssif's plight and who have cared about their boy since then. "Every day we think of CNN and the Burn Foundation and all the people who help Youssif," his father says. "I want to say thank you to everybody." And the boy whose life has changed and who in the process has changed many lives is now rallying his family. "Come on guys," Youssif exclaims, before starting on another journey in his new life.